The Christmas Card – A Hallmark Classic! The Christmas Card has come to be a Christmas movie classic! I tend to watch a lot of Hallmark Channel and a lot of people I have interacted with who watch the channel as well all agree on this. I don’t have a specific reason why this Christian movie is so well-liked even now that it has been more than 10 years since its release, it’s just that the whole film is quite a special experience. It has been so popular among Hallmark viewers that it has been considered a Hallmark Hall of Fame movie. This Christian movie is about a soldier who’s home on leave that decides to visit the small town and the woman who wrote him a card while he was away on duty. 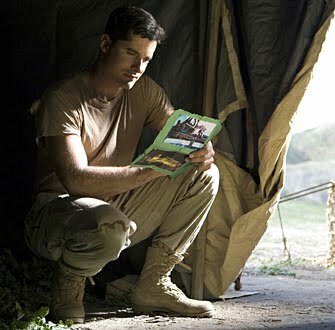 The Christmas Card begins in Afghanistan where Sergeant Cody Cullen is, in the middle of a war. A soldier gives Cody a Christmas card that actually came from Nevada City, California, the soldier’s own hometown, and the card says it’s from a woman named Faith Spelman. A few months after the card was given to him, he keeps on hanging onto the card. It’s a reminder of family to him, he didn’t have family himself and his father had passed away when he was serving in the Vietnam War. Plus the soldier who had given him the card was tragically killed in an attack from the enemy. After all of this, Cody’s superior encourages him to go back home for a while. He decides to go on leave but he couldn’t go to his home just yet. It’s nearly Christmas so Cody decides to go to Nevada City and visit the fallen soldier’s widow so he can give her the dog tags her deceased husband owned. Now purpose has its way in this Christian DVD when Cody bumps into Faith, the woman who had sent the card, in a local diner and their orders get mixed up. Immediately Cody feels a connection with the woman and knows for sure that this is the woman who sent the letter. Of course, Faith didn’t know who he was. Just about when Cody is soon to leave town, he saves Luke, an old man who happens to be Faith’s father, from a speeding car. Luke is very grateful to the soldier so the man manages to get Cody to stay a while longer so he can help in his logging company. This puts a smile on Cody’s face since now at least he can get to know the mysterious Faith. All hopes of being with Faith from The Christmas Card in the future comes to a halt when Cody meets Paul, Faith’s boyfriend. Paul is quite different from Cody. For example, Cody is willing to do anything to be close to Faith and being with her. On the other hand, Paul tends to travel a lot and is never around plus he really doesn’t like being in Nevada City. This is why occasionally Paul mentions the idea of having Faith move away with him but all Faith wants is stay in her hometown, close to her family. It seems like as if Paul doesn’t appreciate Faith and doesn’t really listen to what she really wants. Later on in this Christian movie, Cody continues to spend time with Faith and can’t deny that he has deep feelings for her and loves her. It seems as Faith also has feelings for Cody but in her case, things could get complicated. Now, Paul wanting to secure his relationship with Faith, he proposes to her and not knowing what to do, Faith says yes. On Christmas Eve, Cody meets up with Paul and admits that he has feelings for Faith but won’t stand in the way of her and Paul’s soon-to-be marriage. He deeply wishes them all the best but most importantly, he reminds Paul to take care of Faith and love her. In the service Faith can’t concentrate as she can’t seem to see Cody from where she is, this, of course, Paul notices and becomes quite angry. When the pastor mentions the military in his sermon, Faith immediately thinks about Cody once again, she exits the church and tells Paul that she can’t marry him. What we’ve seen in this Christian movie up to this point makes us think that Faith is going to find Cody but, will she find him in time before he leaves town? I’ll say no more spoilers and let you check this Christmas movie out! You can find The Christmas Card and other Christian DVDs in the Fishflix Store.